Of recent there has been a substantial buzz around beacons. Up to now brands have mostly positioned their location-based marketing techniques around Wi-Fi and geo-fences, but a shift is occurring. Beacons, with their ability to identify ambient context, have got marketers across a wide array of verticals ranging from stadiums to theme parks and everything in between, all excited about the sheer ability to target consumers at their ‘zero moment of truth’. If you are one such marketer, then our recent ebook ‘How to keep your Customers Happy using Beacons’, with a tip sheet on how to plan effective beacon marketing campaigns, is sure to set you moving in the right direction. Merely purchasing a number of beacons, installing them and waiting for profits to roll in isn’t going to cut it. Here are five factors that all brand should consider before going ahead with beacon deployment. When it comes to beacons, it’s not a one size fits all solution. Different businesses require different types of beacons, based on their needs and architectural complexity. For example, if you run a hotel, you might want to opt for a beacon that aesthetically blends in with your interior decor. On the other hand, if you run a stadium, then you might want to look for all-weather beacons which are more sturdy than general indoor beacons. That being the case, there are higher chances that you will end up deploying a mix of beacon hardware from different manufacturers. If you are deploying a fleet of beacons, say 30 beacons each at three different stores of your brand, then keeping track of these beacons by hardcoding their Major and Minor ids your app will be quite a task. 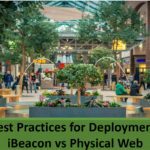 The best way ahead will be to opt for a beacon agnostic platform such as Beaconstac, that will take care of beacon management from end to end. Once you have decided on the beacon platform that suits your needs, you can now decide exactly where beacons will be placed in the desired area of operation. One of the factors that play a crucial role in determining this, is how the beacon will work with your existing application. For example, if you are planning on using your app to offer indoor-navigation then you will have to deploy a large number of beacons than in the case of proximity messaging. Once you have decided on the number of beacons required, you will have to ensure that they are evenly spread out within the desired areas of operation. (a) Accurate positioning – This is dependent on ‘ Advertising intervals’, a term that defines how frequently signals are broadcast by beacons. Greater the broadcasting frequency, more accurate the distance estimations and faster the battery drain. Therefore, if your want to offer indoor navigation and positioning, then you will have to raise the advertising interval to ensure higher accuracy. (b) Beacon Range – This is dependent on ‘ Broadcasting Signal Power’. Higher the broadcasting signal power, greater the range at which mobile devices will be able to pick up the signal and convert it into information. Unfortunately, greater broadcast power also results in faster battery drain. That said, you can change the broadcasting power based on the use-case in hand. For example, if you want to trigger contextual notifications only when a consumer is very close a particular beacon, then you can reduce the beacon’s broadcast range by lowering the broadcasting power. On the other hand, if you want your beacons to broadcast over a large space such as a parking lot, then you will have to increase the broadcasting power in order to ensure that mobile devices can pick up the signal from far itself. Beacons being radio transmitters, stand the chance of interference, as radio signals can be absorbed by different media, such as water, air, human bodies or even metallic surfaces. The best way to deal with this, is to realign your beacons within the desired area of operation such that there is no proximity to metallic surfaces. With beacons being something relatively new in the market, all beacon manufacturers are continually finding new ways to get the most out of the hardware. Thus, each beacon firmware update will provide you with specific enhancements such as battery saving intelligence, general improvements in beacon performance or may even add new functions and capabilities to them. Another important factor is that, most beacons that are available in the market today have built-in support for over the air (OTA) firmware updates. Therefore, you can easily upgrade your beacon firmware even after they are deployed. Also, while chances are that the overall enhancement in beacon performance might be small from one update to the next, if you keep skipping these updates, they will quickly add up and leave you on the losing end. Therefore, it is always recommended that you keep a frequent check for new firmware updates. 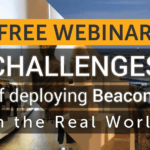 Webinar on ‘Challenges of deploying Beacons in the Real World’ – You are invited!